Dennis Chaney, our client with Friends of Mt. Hood, and I traveled up to Mt. Hood yesterday with KGW 8 Reporter Keely Chalmers and her cameraman Ken. We visited Ski Bowl first to see the downhill mountain bike course there. Then we crossed over Highway 26 and drove up Westleg Road to the base of the Jeff Flood lift. Everywhere you look where trees had been logged, stumps ground or land disturbed – the land was still hammered years later. The land here is volcanic ash soil – like confectioner’s sugar. The soils are powdery and the plants struggle to return on the steep cut banks along roads, around the lifts and towers, and in the clearcuts. The disturbed soils are in poor condition in significant portions of the landscape. When RLK and Co – the operator of Timberline Lodge – first proposed the downhill bike park they thought they could just push it through and exclude it from environmental analysis. The land is already impacted and seriously degraded, so I guess some there think what’s the big deal in taking out more trees and cutting 15 miles of trails on this land. 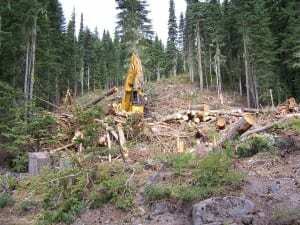 The irony, however, was when the Forest Service’s experts came up to take a closer look, they found that the promises RLK had made regarding their plans to restore the land after the Jeff Flood lift was built had not been kept and the land was in a degraded condition and not functioning properly. The bike park would do more damage, not to mention its impact on Rocky Mountain Elk during the time these creatures occupy the land. RLK & Co’s representative tells the public it can build the trails so that sediment is not delivered to streams, but their Canadian contractor has absolutely no experience with volcanic ash soils and he himself indicated that an area around Tahoe is having a very hard time keeping its park from falling apart on similar soils. Even worse, he said would rely on natural vegetation to regrow on the miles and miles of cut banks and exposed soils the trail building would leave behind. Based on the Friends of Mt. Hood’s decades of experience monitoring the fragile alpine ecology at Mt. Hood – this is wishful thinking. Leaving aside the environmental concerns, the downhill gravity bike adventure park would also impact the forest around the Historic Timberline Lodge – a place which is every Oregonian’s mountain home. This is not just another sight to see while loud music blasts in the background during the downhill races Timberline’s operator plans to host on the mountain. Timberline Lodge, Multnomah Falls, Crater Lake – these are all Oregon treasures – and the integrity of these places depends on maintaining the land in its natural setting. Our clients, the Friends of Mt. Hood, the Native Fish Society, BARK, Northwest Environmental Defense Center and their many supporters are all for people having fun on Mt. Hood. Like many Oregonians, I myself enjoy biking, skiing, climbing, kayaking and other outdoor sports. I have plenty of friends that enjoy all forms of biking from road to cyclocross, from cross-country todownhill biking. And I know that bikers support the protecting the environment. We already have a downhill gravity park at Sandy Ridge, at Mt. Hood Ski Bowl, at Post Canyon in Hood River and a mecca in Oakridge – there are places already for downhill mountain biking within fairly ready driving distance from Portland. Now Mt. Bachelor is planning a large bike park. There may be a demand nationally, regionally and locally, but no one can provide numbers showing there is this much pent up demand. The weekend may be busy but we have a million acres on the Mt. Hood National Forest and we can find another suitable place if that is what is needed – if neither Ski Bowl or Sandy Ridge can expand. We only have one Timberline Lodge. 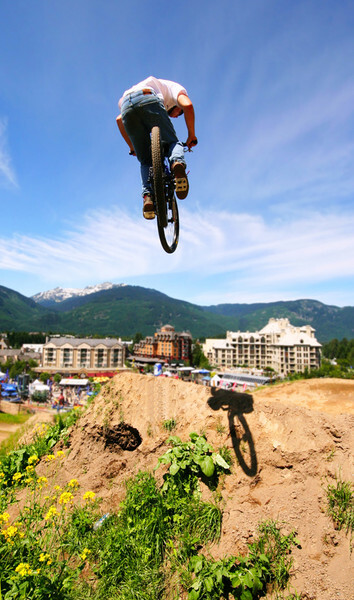 We already have four other great locations for downhill gravity mountain biking. RLK & Co should focus on cleaning up the mess they have made of the mountain from the millions of pounds of salt, roadbuilding, platform construction and tree cutting. Instead of further degrading it and in the process detracting from the special sense of place that all Oregonians feel at Timberline and its surrounding forest environment.